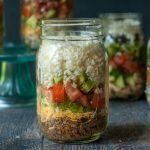 Here are 5 low carb cauliflower salad jars you can take for lunch this week. All full of healthy, satisfying ingredients and come in the following flavors: Mexican, Cobb, Asian, Nicoise and Greek. In a quart size mason jar with a wide mouth start layering your ingredients. Make sure to start with your meat on the bottom and the rice on the top. Secure lid and refrigerate until ready to eat. To eat, dump into a large bowl and add dressing.